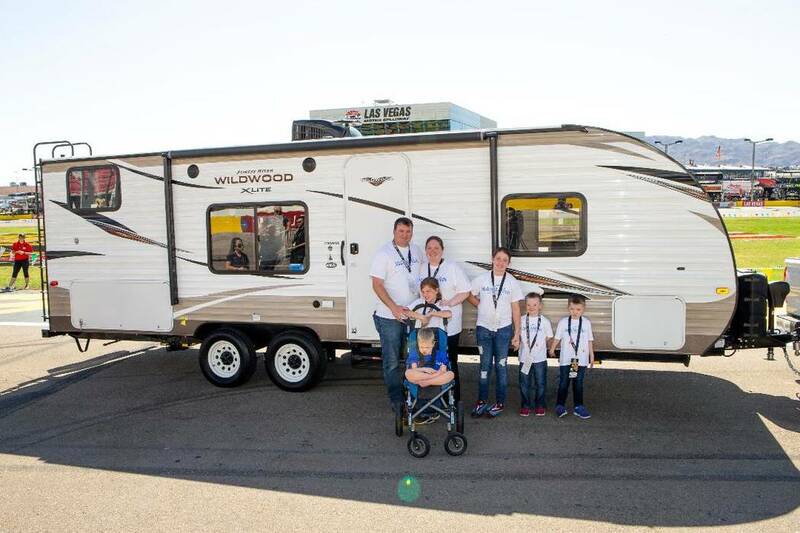 Make-A-Wish of Nevada combined forces with Findlay RV to present a Forest River Wildwood 27-foot travel-trailer to a family in need during the recent Monster Energy NASCAR Cup South Point 400 weekend at Las Vegas Motor Speedway. Andrew Stacey, 4, of Las Vegas has a life-threatening illness, and the trailer enables him to travel with his family when they take trips. Findlay RV sold the Forest River Wildwood trailer to the family at cost and, in addition, donated all of the hitch work needed so the unit could be towed, while Findlay Toyota and Findlay Management donated a combined total of $10,000 to the cause. Andrew has medical needs that preclude him from going camping and on other trips with his family. With the trailer, everything was available including a refrigerator and air conditioning to keep his medications cool. Making the presenting were Make-A-Wish board member Kevin Camper, Findlay RV General Manager Reuben Figueroa, LVMS publicist Jeff Motley, Make-A-Wish Southern Nevada CEO Caroline Ciocca and Make-A-Wish Southern Nevada wish manager Tylar Pendgraft. Make-A-Wish Foundation is a collection of 62 local chapters throughout the United States that grants the wishes of children diagnosed with critical illnesses. The foundation headquarters is in Phoenix, the same city where it was founded. Every eligible child who is referred to Make-A-Wish will have a wish granted. A wish must be deemed legal and safe for all participants involved. Funding and resources are always of utmost concern, and public support is needed to ensure the foundation continues to grant children’s wishes. Findlay Auto Group CFO Tyler Corder said the company teamed up to make the presentation possible. Findlay RV will host a sales event Oct. 22-28 at the Silverton. Further information regarding Make-A-Wish Southern Foundation can be found at www.snv.wish.org. Findlay RV is part of Findlay Automotive Group founded by the late Pete Findlay in 1961. The dealership is co-owned by primary owners Michael Hohl and Cliff Findlay. Hohl owns and operates several dealerships in Carson City, including a GM Superstore, Honda, Subaru, Battle Born Harley Davidson and an RV dealership. Findlay RV is open for sales Monday through Saturday from 9 a.m. until 6 p.m. and Sunday from 9 a.m. to 5 p.m. Service is open Monday through Friday from 8 a.m. until 5 p.m. and Saturday from 9 a.m. until 5 p.m. Further information is available at www.FindlayRV.com or by calling or texting 702-435-2500 for sales, service or parts.